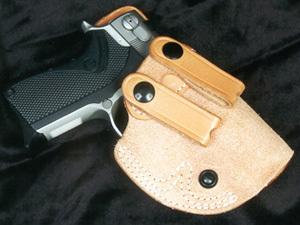 This is a holster that I particularly like. In general, “inside the waistband” (IWB) holsters provide some of the best concealment and security of any type of holster. In specific, the High Noon Down Under provides a superb combination of value, quality and features. The Down Under is worn inside the pants and rides extremely low for superior concealment. It features rough side out for additional grip to the exterior, leather lining, and a reinforced holster opening that is crush resistant for one-handed re-holstering. Additional features include stitched in sight track, tension screw for adjustment of the draw and a slide guard which prevents the slide, hammer and sight from wearer contact. It is made to fit up to a 1-3/4 belt (1-1/2″ is optimum) and is available in right or left hand, natural finish. Optional 1 1/4” strap may be purchased separately. The Down Under is IDPA Approved. 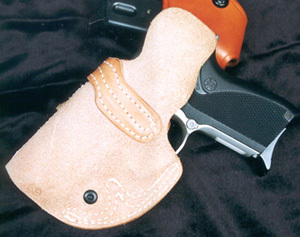 The feature that initially drew to the Down Under was the “ear” or slide guard which prevents the gun, and especially the safety, from rubbing against the body. The result of the ear is comfort and protection of the gun’s finish. This is appreciated during the hot months when sweat poses the greatest threat to gun finishes. The combination of being an IWB and having the tensioning screw makes the Down Under ideal for those who like a very secure holster which grips the gun tightly. The only style of holster more secure would be one with a thumb break. The stitched in sight guide is hard rubber which we have found to greatly enhance the speed and smoothness of the draw. IWB holsters which lack the sight guide can catch the back of the front sight during the draw stroke, depending on the shape of the sight. The sight guide on the Down Under eliminates this snagging for a smoother and quicker draw while nevertheless holding the gun securely. One of my friends who tested this holster switched to the Down Under for his IDPA matches from a much more expensive holster because he liked the smoothness of the draw with the Down Under. Add all of these features and an extremely reasonable price, and you get a package that is hard to beat. I like this holster so much that I have three of them.